We have loved to travel, going on 40 years now. So this is a record of places we’ve been, stuff we’ve done and liked. Of course, we’ve seen lots of changes, both in ourselves and in the places we’ve visited (or, often, revisited) over the years. Images, for example. Back in 1968, when I was a poor graduate student, the only camera I could afford was a cheap thing that took square photos, obviously not of the best quality. But film and developing were expensive enough that I tended to be very careful about taking pictures. As a result, there aren’t a lot of images of that first trip. And now we have digital cameras and we can (and do) take enormous numbers of pictures of everything. Which means that the longest lasting journey I took, to Europe in 1968, has a real paucity of pictures–maybe one or two of Paris, London, Amsterdam, Belgium. But I have learned from this that taking lots of pictures is important–alas, this is now hindsight, and not useful advice to anyone now since we all do it anyway. Rather too much, I suppose. 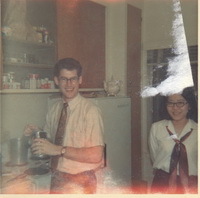 Here I am in Berkeley at age 25, with June Fukuda, later David Otis’ wife. 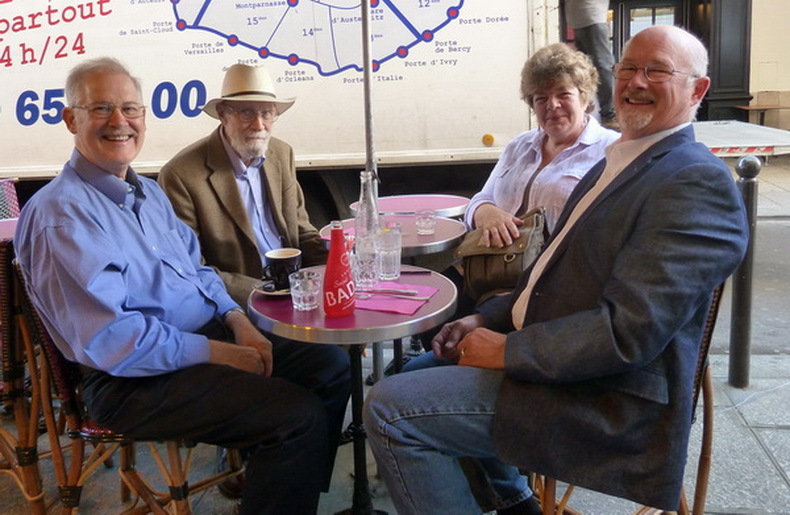 Here we are in a street cafe in Paris on our last day of our last great trip. What I have noticed is that there are fewer and fewer pictures of us as we have gone on. Owen’s Parkinson’s makes it difficult for him to hold and focus, so he doesn’t like to do it, and he doesn’t like pictures taken of him any more. So those images rather peter out over time. But we did take a lot on that first trip to Germany. One trip we did with video. Big mistake, lively as it was in some ways. I no longer have a way to show that, so there are few pictures of England in 2000. Owen died December 1, 2014, after a very difficult last year. So our travels are over, leaving wonderful memories behind. My brother and his wife–Kim and Pam–took a trip with me in March/April of 2015, so my travels continue.